With a breadth and depth that no single–authored source could provide,A New History of Anthropology collects original writings from pre–eminent scholars in the field, to create the most complete and comprehensive book of its kind. 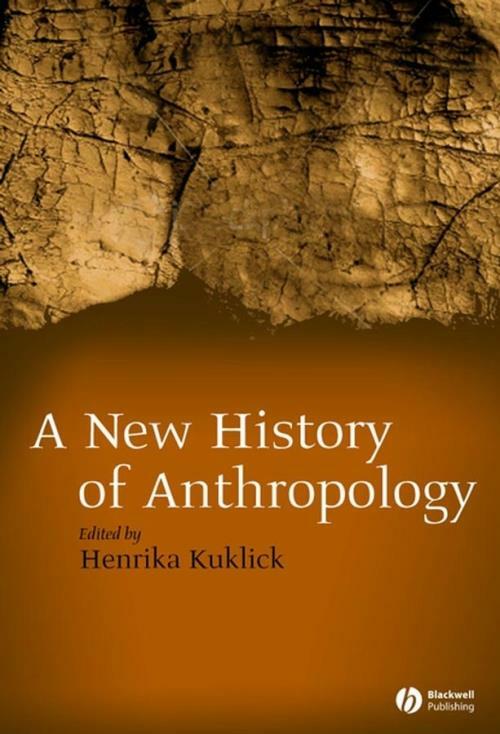 Situating ideas and practices within the context of their time and place of origin, A New History of Anthropology begins with an examination of the prehistory of the field, during the ′age of exploration′. The volume then continues its evaluation by examining the various anthropological traditions present in the field’s early work, discussing the numerous topical issues that arose in the field as it evolved, and looking into anthropology’s future by considering its relationship with other disciplines and its own disputed history, all through the lens of a new global perspective. Sophisticated but accessible, A New History of Anthropology is an ideal tool for both the teaching and learning of the history of anthropology. Introduction: Henrika Kuklick (University of Pennsylvania). 1. Anthropology before Anthropology: Harry Liebersohn (University of Illinois, Urbana–Champaign). 2. North American Traditions in Anthropology: The Historiographic Baseline: Regna Darnell (University of Western Ontario). 3. The British Tradition: Henrika Kuklick (University of Pennsylvania). 4. Traditions in the German Language: H. Glenn Penny (University of Iowa). 5. The Metamorphosis of Ethnology in France, 1839–1930: Emmanuelle Sibeud (University of Paris VIII). 6. The Spiritual Dimension: Ivan Strenski (University of California, Riverside). 7. The Empire in Empiricism: The Polemics of Color: Barbara Saunders (University of Leuven). 8. Anthropology and the Classics: Robert Ackerman (Clare Hall, University of Cambridge). 9. Anthropology on the Periphery: The Early Schools of Nordic Anthropology: Christer Lindberg (Lund University and Turku University). 10. Colonial Commerce and Anthropological Knowledge: Dutch Ethnographic Museums in the European Context: Donna C. Mehos (Eindhoven Technical University). 11. Political Fieldwork, Ethnographic Exile, and State Theory: Peasant Socialism and Anthropology in Late–Nineteenth–Century Russia: Nikolai Ssorin–Chaikov (University of Cambridge). 12. Using the Past to Serve the Peasant: Chinese Archaeology and the Making of a Historical Science: Hilary A. Smith (University of Pennsylvania). 13. The Anthropology of Race Across the Darwinian Revolution: Thomas F. Glick (Boston University). 14. Race across the Physical–Cultural Divide in American Anthropology: Jonathan Marks (University of North Carolina, Charlotte). 15. Temporality as Artifact in Paleoanthropology: How New Ideas of Race, Brutality, Molecular Drift, and the Powers of Time Have Affected Conceptions of Human Origins: Robert N. Proctor (Stanford University). 16. Women in the Field in the Twentieth Century: Revolution, Involution, Devolution? : Lyn Schumaker (University of Manchester). 17. Visual Anthropology: Anna Grimshaw (Emory University). 18. Anthropological Regionalism: Rena Lederman (Princeton University). 19. Applied Anthropology: Merrill Singer (Yale University).